NEW YORK, NY – One of the newest, hottest, yet little known reggae singers has just released his new album, Crown of Fire. Junior Toots, son of reggae legend Toots Hibbert of Toots and the Maytals, has a sound unique the reggae world of today; he is defining a new style with the same enthusiasm as in the early days of reggae music. Crown of Fire features fourteen scorching tracks unveiling the roots of reggae and its culture to a new generation. His devotion to the path of the Rasta life is clearly known through tracks like “Jah is Real” and “Gift of Jah“. It is enough to awaken and enliven the spirit of any listener. Junior Toots’ passion and fervent heat is felt through songs like “Love is All We Need“, “Love is What They Need“, and “Love is What You Need“. As the son of Reggae Legend and Grammy Award Winner Toots Hibbert, he revisits the classic song “54-46 Was My Number” with his own account, creating a future classic. Receiving various awards and acclaim over the past few years, Junior Toots toured with Toots and the Maytals from 1997 to 2004, opening shows with his original tunes or joining his father on stage. Over the last few years, Junior Toots has taken time to develop and define his own style and launch his solo career. 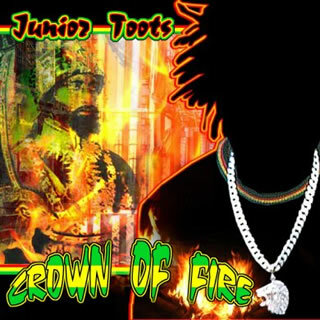 Junior Toots and the Crown of Fire is sure to awaken a society, shake a nation and torch the music scene! Be among the first to discover a new movement in reggae music. To download a press kit, images or for more information, visit Junior Toots on the web at www.jrtoots.com. Interviews are available upon request. For booking, call (510) 478-0402 or e-mail booking@jrtoots.com.